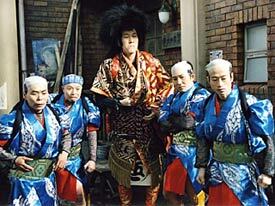 (left) Koji Yakusho, and (right) denizens of the University of Laughs. The Skinny: A beleaguered comedy troupe writer must go toe-to-toe with a strict government censor in this hilarious, ultimately touching film from director Mamoru Hoshi. Based on Koki Mitani's hit play of the same name. While comedy always runs the risk of being lost in translation, Mamoru Hoshi's University of Laughs suffers from no such problem. Based on the popular 1996 stage play by Koko Mitani, this adaptation makes a successful leap to the big screen and is sure to have audiences rolling in the aisles, no matter what their national origin may be. Also, while the film never fails to entertain, it allows its audience to consider the deeper issues at the heart of all the punchlines, a trait which gives the film a greater sense of substantive heft than most comedies nowadays. Set in 1940 Japan, the movie centers on seven days in the life of Hajime Tsubaki (SMAP's Goro Inagaki), a jittery, but earnest writer/director for an Asakusa comedy troupe who is obligated by law to submit his latest script for government approval before it can be performed in public. This normally wouldn't be much of a problem since Tsubaki's previous visits to the censor have resulted in approval with only minor edits. But this time around, our hero faces a rather challenging obstacle. Unfortunately for the hapless writer, there's a new sheriff in town in the form of Mutsuo Sakisaka (the great Koji Yakusho), a hard-nosed police censor with a big axe to grind with purveyors of "lowbrow" entertainment. Unimpressed and even furious with some of the liberties Tsubaki has taken in his script, Sakisaka mercilessly points out the "faults" of the play, believing them to be too extensive to be revised. Although other writers might have refused to alter their work due to artistic reasons, Tsubaki has no such qualms since he clearly prescribes to the belief that "the show must go on." Thus, he pleads with Sakisaka, who eventually agrees to allow him another chance, suggesting that the playwright make certain key changes and come back the next day. And so begins a seven day battle of wits between the two men that eventually blossoms into the unlikeliest of partnerships. Although the first few meetings begin with the seemingly humorless Sakisaka making unreasonable demands, Tsubaki soon realizes the stoic official has a talent for comedy. With each passing visit, Sakisaka transforms from censor to de facto script doctor, evaluating the play less for its possible inflammatory content and more on its comedic value. Although he seemingly cannot comprehend humor, he makes several important observations, often considering the character's motivation and whether certain actions make sense within the plot. Consequently, Tsubaki's parody of Romeo and Juliet - which seems funny on its own - becomes even funnier thanks to Sakisaka's unconventional help. Although frustrated by the process, Tsubaki soon learns that when an artist is forced to work within constraints, he can sometimes create something ten times better than he ever could when he had complete artistic freedom. But even as this partnership flourishes into something wonderful, the specter of the outside world threatens to destroy it all. Since University of Laughs is essentially a movie about two guys in a room talking, the success of the film hangs heavily on the performances of its leads, and thankfully, they both come through in spades. The film boasts a fantastic acting turn from Koji Yakusho, who is more than worthy of the accolades thrown his way in regard to this film. Smartly, his character is neither written nor performed as a fool, as one might expect in a film in which an artist battles against an authority figure. Similarly, Sakisaka is not a one-note bad guy, but instead a complicated, yet inherently good human being, one who comes to respect and even like Tsubaki, but must battle against his own loyalties and personal hang-ups to successfully maintain this wholly unexpected "friendship." Goro Inagaki serves as an effective foil to the often stern-faced Koji Yakusho. Although his character is willing to accommodate the censor's demands, Inagaki makes sure to show that his character is fighting it all the way. And thus, his character should not be seen as a complete pushover, just a comic in a never-ending pursuit of a laugh, who adapts to this situation in the hopes of making his script even stronger. 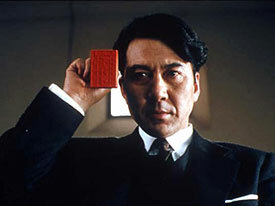 In that respect, he bears the hallmarks of a true artist, or as the movie explains, one particular kind of artist. Although Sakisaka makes the greater personal journey in terms of character growth and is therefore much more interesting, Tsubaki is very much integral to the film, and Inagaki holds his own with veteran actor Yakusho. By the end, both actors have charmed the audience and earned an equal share of the laughs thanks to their always entertaining verbal by-play. Of course, the underlying social issues that are central to this movie cannot be ignored, nor should they be. Considering its content, the film seems eerily timely, as the idea of a government stamping out freedom of expression in the name of wartime concerns will register with many viewers across the globe. This social commentary informs the emotional journey that happens right underneath our noses as the film progresses. The burgeoning friendship between Sakisaka and Tsubaki climaxes in the film's poignant final scene. Here, the reality of war, which until then had only been something that existed outside the walls of their meeting room hits frighteningly close to home. The emotional pull of these scenes is well-earned and laces the finale with a sense of hope despite its open-endedness.